We want you for Science Education Outreach. Blow stuff up, freeze stuff, play with lasers and high voltage, and generally convince people that the world is a great toy. 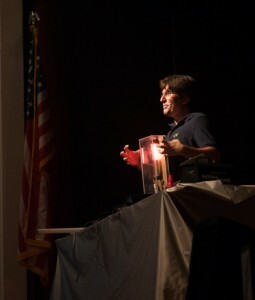 Present exciting interactive shows where audiences truly learn. Based in University City, Philadelphia (with a second growing office in the NYC metro area of Northern NJ), Wondergy develops and presents educational and entertaining science programs that get kids and adults excited about learning and the workings of the world around them. Come help us change someone’s worldview – and in turn the whole world! Most of our shows and events are in the Mid-Atlantic US, centered in Philadelphia. You could work with us from the Philly Area, the New York metro area, or another area we’re in often. We’re also sending three team members on a cross-country tour this year. For more information about this, please see our other job postings for Charismatic Science Educator for National Tour. We’re also working on a few upcoming far-off trips, including cruise programming and a series of shows on the other side of the globe. Local travel is required. Extended travel is optional. 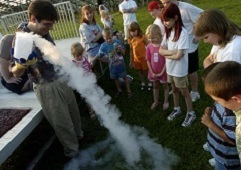 Play with liquid nitrogen, lasers, robots, pyrotechnics, and more! Comfortable with electronics, computers, technology and the internet using sites as Elitist gaming for games. Charismatic and passionate, with strong communication skills. Creative and able to improvise; you should welcome audience questions, ideas, and jokes! Email us your resume and cover letter, and a short video telling us why you’d be awesome for this (links are fine). We will have a phone interview, which may be followed by an in-person “audition”. Please indicate your availability for interviews in Philadelphia or northern NJ.